Alexander Kluge: Sie sagen irgendwo, dass ein gesamter Lebenslauf aus lauter Zufällen bestünde. Sind sie wirklich dieser Meinung? Niklas Luhmann: Ja. Man muss natürlich Zufälle erkennen und ergreifen können! Und das setzt eine gewisse Vorbereitung voraus. from: Vorsicht vor zu raschem Verstehen. Niklas Luhmann im Fernsehgespräch mit Alexander Kluge, in: Wolfgang Hagen (Hg. ), Warum haben Sie keinen Fernseher, Herr Luhmann? Letzte Gespräche mit Niklas Luhmann, Berlin, Kulturverlag Kadmos, 2004. Koen Brams/Dirk Pültau: You studied at the Film and Television Academy ..? Jef Cornelis: The Film Academy. That was its name when I arrived there in 1959. I had actually been working on theatre, but I couldn’t find my feet. I had almost signed up at the Herman Teirlinck Studio. A number of candidates who wanted to direct were given a chance to work with Fred Engelen. But I didn’t settle in. Amsterdam was a means of getting away. K.B./D.P. : When you began studying film, the Film Academy had only existed for a year. It was a two-year programme, 30 weeks per year. What did you get out of it? J.C.: Not so much. I was also very young, barely eighteen. Most of the other students were older. If I recall, there were 700 candidates who took the entrance exams, and the exams lasted for three days. Paul Verhoeven was in my year, and Jan De Bondt, the cameraman. After the first semester, there was a second round of eliminations. I didn’t understand any of it. I never did understand how that institute was put together. There were also work-study positions, but I escaped that, because I was organizing something in Belgium. K.B./D.P. : So in fact, your training was not worth much? J.C.: Nothing at all. I might well not have finished at all, because it didn’t interest me. The courses didn’t mean much, but the cinema did! I had been going to the cinema ever since I was little. I lived in the cinema instead of in the woods, even though we lived in Brasschaat. I rode down to Paris with my friend, Harry Gruyaert. You could see it all there. I also went to the cinema a lot in Amsterdam. It was also part of the programme – once a week to the Film Museum. By seeing it, you know how you should do it. K.B./D.P. : How important was Anton Koolhaas, one of your teachers, for you? J.C.: He could read well. K.B./D.P. : What did he read? J.C.: Scenarios. That was his great strength. K.B./D.P. : …more than the feature film. J.C.: That is a Dutch tradition I have no feeling of identification with. K.B./D.P. : But perhaps you have something in common with Koolhaas’s vision? J.C.: No. It was only his reading that I appreciated. I felt that the man had a beautiful voice, and it was pleasant to experience it, but I never felt any real impact from him. Knipping did strike the right cord, John B. Knipping, a Franciscan, an erudite man. I read about all that, not about Francis, but about the period between the beginnings of modernity and before. Knipping is someone who has been important for me. And Willy Ph. Pos, who taught Greek drama history. J.C.: …that relate to my work? K.B./D.P. : Yes, statements that would imply the same vision. J.C.: That would be interesting, but I have never seen a connection. J.C.: But we were there for the fiction. David Lean received a lot of attention, but I had French cinema on the brain. Nobody knew that in Amsterdam. I brought that along with me. It meant an interesting tension. K.B./D.P. : When did documentary become a passion for you? J.C.: I was stuck in Amsterdam. It’s as simple as that. But indirectly, it did offer me something. At the time, notices were being posted in Belgium looking for applicants to work for national television. I had the advantage of a professional training. In 1960, I wrote a letter and attended one of the forums where the management explained the public broadcasting corporation. J.C.: It was while shooting my first film for BRT about the Alden Biesen castle. I couldn’t get a handle on it. I didn’t know what it was, but it was a terrible experience and in my opinion, a dreadful film. But what happens? Everybody thinks it’s fantastic and I get the chance to make another film – a film about the Park Abbey in Heverlee – for which I got to work with the right people. K.B./D.P. : What did you do after your studies in Amsterdam, immediately after? You just said that you “were organizing something in Belgium”. J.C.: That was an instructional film, a 16mm for De Schutter Photo Engravers, a company in Antwerp. Not exactly something to write home about, but De Schutter wanted to hire me. They did not much care for my conditions, however. After that, I completed my military service. Then I focused on theatre once again, as a director. I made several more films to earn some money. K.B./D.P. : How did you get involved in the film about Alden Biesen castle? J.C.: I was hired by the BRT to work in their entertainment department. They had received information about me from the headmaster of the Norbertine school in Brasschaat, where I went to secondary school. That’s the way things were done then at the BRT. As part of my training, I received an assignment to follow an opera by Mark Liebrecht. In the absence of the director of television – that was Bert Janssens – I was ‘headhunted’ to what was then called the department of artistic and educational programmes, a department that stood for everything that had anything to do with art. Herman Verdin headed the department. Ludo Bekkers and Annie Declerck worked as programme producers. It was Verdin who took me out of entertainment, because he had unexpected problems completing a film about the Castle of Alden Biesen. K.B./D.P. : Which problems was Verdin facing? J.C.: Jan Materne was originally going to create a film about Alden Biesen, but it proved impossible and I was asked to replace him. There was no structure at the BRT. Programming was improvization. K.B./D.P. : How far along was the production? J.C.: Everything had really already been set – the script, the team. It was just a replacement position. I had a probationary contract. I rewrote the script, because I couldn’t work with what was there – but I couldn’t change the team anymore, and that was a disaster. The film about the Castle of Alden Biesen was a real shock – all my illusions were shattered in one fell swoop. J.C.: I had arranged for a cinema in Bilzen to be available, where I could watch the rushes after the cinema showing, because it was a 35mm film. They shot 35mm in those days! I had to do everything in my power to make it clear to the cameraman that his images were crooked. After three or four days I asked his assistant to take over the camera. In short, the conditions were not there to make a good film, and so it did not end up being a good film. The highlight was that everyone was very madly enthusiastic. There are some interesting moments in the film, but as a whole, it’s rubbish. I probably owe everything to that film, but I thought it was an eyesore. K.B./D.P. : Because the film was successful, you were immediately asked to make the film about the Park Abbey in Heverlee. J.C.: I hadn’t even finished editing Alden Biesen when I was urgently asked to get into a car with Herman Verdin, Roger Marijnissen and Ludo Bekkers. Marijnissen would provide the script and Bekkers was supposed to make the film, but Verdin decided that I would do it. It was as simple as that. I’m not the kind to try to grab power, but there was no grabbing of anything. There was no power. There was nothing to fight about. All you could do was live up to the expectations. And I had several chances to do that. K.B./D.P. : In your archives, I found a document, dated November 9, 1963, that mentions “dance sequences”. J.C.: That was a note from Roger Marijnissen or Ludo Bekkers. The intention was to have a group from Mechelen dance. It was part of the plan for a film Ludo Bekkers wanted to make. K.B./D.P. : How was working with Marijnissen? J.C.: I can tell you where the collaboration ended. It was in the square facing the Leuven train station, in a café. I told him, “I think it’s all fantastic, as long as you leave me alone. You’ve done your thing, so we’ll see each other again, later.” At that point, all that was hardly self-evident – I was only 22. Later, a day was organized for the press, with Roger Marijnissen presented as scenario assistant and Ludo Bekkers as programme producer. K.B./D.P. : Did Roger Marijnissen contribute anything? J.C.: Yes, but I eventually got my own way. Those first two years at BRT were pure survival, but by then, you are probably up to doing more, and were probably a lot more brazen as well, than you would normally have been. K.B./D.P. : Were you able to put your own team together for Park Abbey? J.C.: Yes, I was given exceptional production facilities. I could choose my own team: Harry Gruyaert for photography; Herman Wuyts for camera, assisted by Oscar Fischler. Wuyts was an excellent cameraman. K.B./D.P. : How did you end up picking Herman Wuyts? J.C.: I knew Wuyts through “Group 58” in Antwerp. You come across people along the way, but we didn’t stick it out together very long. Why? I don’t leave anyone alone, you understand. If I don’t have control over a team…. I can’t bear my colleagues doing something I don’t want them to be doing. K.B./D.P. : Pieter Verlinden on soundtrack, was that your choice? J.C.: No, he volunteered, but it might also be that Bekkers recruited him. There were no composers. I did not start working with composers like André Laporte until later. Pieter Verlinden was the only one we could afford and he worked quickly. You also have to take into account the way things operated. Verlinden was composing before he had even had a scenario from me. But things soon went wrong with Verlinden, too. He thought what I was making … didn’t amount to much. J.C.: …and that I wasn’t frightened by it? K.B./D.P. : Yes, it really is remarkable. J.C.: Do you think so? There was no other option. But it worked! I was lucky that they gave me abbeys and castles. I had to learn the craft. Where else could I have learned it? I was allowed to utilize the last remaining vestiges of Flemish Glory, our monasteries and castles, but I gave it a twist. It also generated a lot of response, and without feedback, you get out of it. And I have to say, I took time for the productions – time that Herman Verdin also gave me leeway to take. There were quite a few structures built for the Park. That cost a lot of money, but Verdin did not consider that an obstacle. He supported me through thick and thin. When he left for the University in Leuven, I could no longer do what I wanted to do. Jerome Verhaeghe succeeded him and in my first serious project under his leadership, Waarover men niet spreekt, (What one does not speak of), the trilogy, there were endless deliberations, right up to and including the executive board. K.B./D.P. : The only spoken text in the film was from the 1736 specification about what was required for “income and clothing in de abbey of Heeren Perck, near Loven”. J.C.: Yes, and Ludo Bekkers reads the text. I deleted all the other text. K.B./D.P. : Was it really in your line to make a film about an abbey at that age? J.C.: I think so, yes. Are you surprised? I didn’t view the monastic life as a personal destination, but I was fascinated by that system. Besides, I came from the Norbertine school in Brasschaat, and the Abbey in the Park was a Norbertine abbey. I’m interested in monasteries and abbeys. But for me, it was mostly an opportunity to earn some money and to get down to work on something serious. K.B./D.P. : To start working in that medium? J.C.: I shot 35mm film, not on Agfa, not on Kodak, but on Dupont. Why? I had checked it out, and I wanted to work with it. K.B./D.P. : How did you arrive at that conclusion? J.C.: Fellini had also worked with it. If you read film credits, you know that. K.B./D.P. : Why did you want to work with Dupont? J.C.: It was the density of the Dupont film. It ended up being a lot of bother just to get the film developed. Black-and-white developing is not so spectacularly difficult, but the lab really has to be on its toes. K.B./D.P. : A really extravagant brochure was published about the film. J.C.: That is something I had nothing to do with. K.B./D.P. : You wrote part of the text. J.C.: Yes, but that’s all. K.B./D.P. : The BRT obviously spared no expenses for the film. J.C.: That didn’t go down well with me. I felt uncomfortable about it. I don’t sell myself. My friend Harry Gruyaert travelled to Paris with the film under his arm. 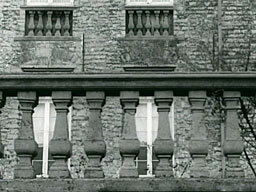 Agnès Varda and her husband, Jacques Demy, viewed Park Abbey. Harry engineered that. K.B./D.P. : That brochure proves that the BRT appreciated you. J.C.: Yes, they even once made displays from my work in the windows, on the ground floor of the Flagey Building, where the BRT was housed in those days. K.B./D.P. : What did they display in the windows? J.C.: Photographs from the films I was making at the time. K.B./D.P. : Photos by Harry Gruyaert? K.B./D.P. : The film did not premiere on television, but in the cinema. J.C.: Before the film was broadcast, it was introduced at the Belgian Film Festival, as an initiative of the province of Antwerp. That must have been in November of 1964, because I had already shot my third film, Plus d’honneur que d’honneurs, about Westerlo Castle. It was so quiet during the première of Park Abbey that you could hear a pin drop. The film won an award and was shown again, and then there were extremely aggressive reactions. K.B./D.P. : It was after the award that the BRT published that extravagant brochure, in December ‘64.Abdij van het Park had not yet been shown on television. The film on Alden Biesen had been, on November 5th, 1964. Park Abbey was aired on 25 December 1964, and Plus d’honneur que d’honneurs on April 16, 1965. Where else was Park Abbey shown, besides on television? J.C.: It was shown at the Utrecht Festival in the Netherlands, which eventually grew into the Rotterdam Festival, Huub Bals’ festival. There were several foreign festivals that put it on their programmes. K.B./D.P. : What was the response to the film? J.C.: Did you read what Maria Rosseels wrote? That may have been part of it. Maria Rosseels was on the jury at the Belgian Film Festival. So was Ivo Michiels. Afterward, I heard that the jury had been at each other’s throats. K.B./D.P. : One of the critics, with the initials MR, called the film “L’ année dernière à Heverlee” (Last year at Heverlee). Have you been influenced by Alain Resnais? J.C.: That was the Maria Rosseels piece! Of course I have been influenced by Resnais. But Astruc was more important for me. K.B./D.P. 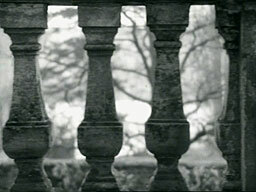 : There is, of course, a relationship between L’année dernière à Marienbad (Last year at Marienbad) and Park Abbey. J.C.: Obviously. But Resnais is dead serious. I can’t stay that serious for long. I can’t. I am, but at a certain moment, there has to be a turning point. In addition to Resnais, Chris Marker also appealed to me, and naturally, Jean-Luc Godard. But Astruc has always been my strongest model. Alexandre Astruc has unjustly fallen into oblivion. I have even read everything he has written. Astruc is seen as part of that generation because of that lousy label, Nouvelle Vague. Astruc shot a series of films that are very fundamental, and that was picked up by the Nouvelle Vague filmmakers. K.B./D.P. : What exactly was it that intrigued you? J.C.: The camera work, the so-called “Camera Stylo”, where the director can express his thoughts in a similar way like writing a novel. I look for the way something is constructed, just as Astruc did. I look for rhythms. I look for rhythms. K.B./D.P. : In Park Abbey you do that, truly literally. What is striking in that film is its very emphatic formalism, and its almost libidinal preference for the serial, for example, in the way the camera slides along the banisters. J.C.: When I made the film on Documenta IV, in 1968, I was confronted with something very familiar. K.B./D.P. : Where does your preference for serialism come from? J.C.: It’s not there in some films, but in Park Abbey, it was almost obsessional. I look for a structure and when I’ve found it, I present it very rigidly, as minimally as possible. By the way, I pushed the camera myself. You can ask around, I pushed everything myself. I engaged myself completely. And maybe that has always been the danger, that I was very radical. K.B./D.P. : Is that typical of a young producer, wanting to be so affirmatively stylistic? J.C.: No. The Landscape of Churches film attests to it just as much, but probably with more refinement. K.B./D.P. : The serial creates the impression of a style exercise. You stress recurring motifs in a very strict manner, for example, with the containers on the banisters. But there are also non-functional moments, for example, when the camera enters a gate several times in succession. K.B./D.P. : This has always been significant for you? J.C.: It is an act of penetrating into. K.B./D.P. : But by scanning the banister, the whole becomes formal, minimalistic. All significance is virtually gone at that moment. J.C.: It is a way of trying to say that it is actually already a monument, that the abbey has all but disappeared. K.B./D.P. : The serial, formal structures are a way of making it abstract. K.B./D.P. : It is comparable to the way the Sint-Baafs Cathedral is portrayed in Landschap van kerken (Landscape of Churches). The space in the Park Abbey where the art collection is housed is almost a museum. You stay for a long time there, where they keep their paintings, their valuable furnishings and all sorts of objects. Actually, you spend as much time looking at images, at representations and paintings, as you do looking at the space in the abbey itself. J.C.: That is representation. And power, pure power. K.B./D.P. : There are indeed a great many close-ups of statues, and of reliefs. Are you more interested in the fact that it is about representation or in the fact that it is petrifaction? J.C.: Petrifaction! The Bible is represented literally. If you look at the library, what do I do with the ceiling? And did I spend a lot of time on the books? Just briefly. It almost becomes a painting, with the books. It’s almost like skin. It is about conclusion. The book is in fact about to be closed. K.B./D.P. : The abbey has become representation. Or life in the monastery has become representation. J.C.: It’s gone. Gone. What the men are consuming is a last supper. I intentionally left the table empty. K.B./D.P. 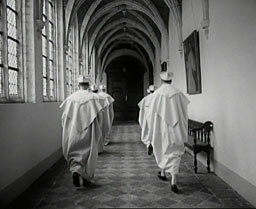 : The film ends in spectacular fashion, with the priests playing billiards. J.C.: That scene caused so much uproar. Somewhere I have a letter in which Bert Janssens, the Director of Television, requests that I cut the scene out. Verdin defended me right up to Paul Vandenbussche, the general director of the BRT. K.B./D.P. : What was the idea behind the priests playing billiards? J.C.: They weren’t priests. They were two or three friars who played billiards for me. K.B./D.P. : You asked them to do that? J.C.: The whole scene was staged. The billiards table was moved, it was a complete mise-en-scene, including the geraniums in the hall. K.B./D.P. : The billiards table wasn’t normally there? J.C.: It must have been somewhere. But it was all composed. Even the mass at the beginning was staged. I had the Norbertines brought on busses, from the Norbertine monastery in Tongerlo. It was all over for the Park Abbey. The building was already two-thirds empty. K.B./D.P. : It is interesting that Pieter Verlinden worked repeatedly with bell tone variations. The sound of a music box reverberates in the gallery with the art collection. There are bells, the sound of the thurible. And the sound of the music box turns into billiard balls crashing against one another. You hear that sound first, and you don’t understand it until you see the friars at work. You can understand the entire film from the perspective of the billiard balls. J.C.: The funny thing, of course, is that the billiards scene is one of the few where the sound was recorded directly. K.B./D.P. : But do you agree with the interpretation of the score? J.C.: I was making a silent film, a film without sound. I cannot repeat that often enough. K.B./D.P. : But that does concur with what Anton Koolhaas says. He refers explicitly to image, not sound. What he is concerned with is thinking in images. J.C.: And that concentration can only be found when you’re surrounded by silence. I don’t need sound. I still think it’s a great loss that the silent film is a thing of the past. There should be music with it, apparently, but I find music distracting. J.C.: The film shows that it is finished. I am interested in the images I can make, because I can still briefly capture that world. That was possible then. It was possible to capture it briefly and intensify it. That was my starting point. Did you see the furrows? Would you like to know how crazy that was? I had somebody out there ploughing in the month of February. That scene was shot in February, 1964. J.C.: …and I had the earth ploughed. K.B./D.P. : For you, was the fact that such practices had come to an end in Belgium the central focus of the film? J.C.: I am not very interested in genius, but I am interested in the concept of living together and community – but I already know that it’s over. The idea of the ‘garden’: it is all still there, but it has shattered, fallen apart. I wanted to capture the garden. That garden was totally neglected and I actually wanted to reveal the garden. There was no more activity. There were no clergy anymore, no more livestock. I had the livestock that you see in the film brought in by a farmer, and even the pigeons. I have been surrounded by quite some pigeons in my life. I think I asked someone to let the pigeons out of the dovecote. It could be, but I don’t know for sure. I dare not claim that with certainty. Television makes things disappear. Things slip from memory, for me, too. The questions concerning the Film Academy are partially inspired by the book by Ernie Tee, Passie en professie. De geschiedenis van de Nederlandse Film en Televisie Academie, (Passion and Profession: the History of the Film and Television Academy of the Netherlands), Netherlands Film and Television Academy, Amsterdam, 2002.